Since last year I’ve moved some things around. Not the large furniture though. All those pieces just seem to be in the most convenient spots. It’s mainly the decoration that has been changed and I hope you like to take the tour even if you have visited my studio last year. This is the view from the door. My cutting table consists of two drawer chests that are placed back to back and therefore provide a large work space – hypothetically, lol. Unfortunately it hardly ever looks so clean and is mostly buried under fabrics, lace and paper. I found this large metal industrial basket some months ago at a scrap yard and knew right away that I had to have it. I use it to store larger fabric and lace pieces. My glass cabinet holds vintage linen and some baskets that are filled with lace. I keep wide pieces of lace on this altered clothes hanger. I exchanged my spring bunting with this one. The burlap I used is very old and solid. I embellished the triangles with lace and buttons. Simple but sweet. I had taken a picture outside before fixing it underneath the shelf. 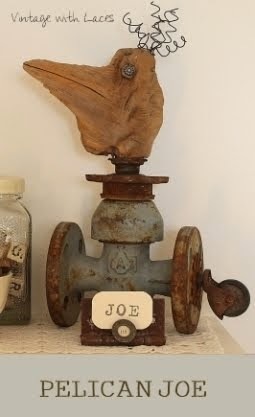 I love vintage sewing notions and like to use them as decorations. The soldered bottle on the left was a gift from Lisa and the pocket in the back was made by Marie. Some things I like to create with: Game pieces, faux pearls, small keys and some bling. Pretty white vintage embroidered monograms. You might know that I have a thing for numbers and they appear a lot in my studio. I love vintage eye charts but hadn’t been lucky to find one. Therefore I made one myself. To add a personal touch, I used my blog name. Some nature finds: Dried thistles, tiny wasp nests, snail shells and a turtle shell. I found everything, except the thistles in our garden. All the beautiful creations on the rusty rake are gifts from blogging friends and I enjoy them very much. The shutter and the old suitcases have moved and now stay beside the cabinet, along with my vintage parasol. The sweet angel doll was created by Dorthe and has a good view point from the top of the cabinet. I’ve moved my computer from the living room/kitchen area into my studio. It’s not so pretty but more practical. Almost everything French inspired now has a place on the corner shelf. Most of the things you see here, are gifts from blogging friends who know how much I love the French theme. Boxes and drawers on my sewing table. You might remember Maybel from the Dressform Ball in March. She stayed in her ball dress for some months, but now changed into a very light summer outfit that I had made for her out of an undershirt, a deco fishing net and some shells. The corset bag on the wall was a gift from Anneke. The doll underneath the cloche was another gift from Dorthe. I’ve redecorated my large white frame and use it now to display my heart collection. Some are gifts from blogging friends and some I sewed myself. We’re at the end of the tour. Thank you for your visit. I hope you enjoyed it. Thank you very much for the party, Karen! I’m looking forward to taking a look at all the other studios. Please click on the button to get to “My Dessert Cottage” with the list of participants. Oh Julia....you have an absolutely delightful creative space! I love it all! From your "Studio sign" to your "lace clipped on hangers"! You have so many great ideas! I shall save this post forever...I will refer to it for reference. I'm moving my creative space this year, so your post will give me much wonderful inspiration! I'm leaving a comment here now but I'm finding that I just want to stay! Everything looks so charming with such an air of elegance. I especially love your newly acquired wire basket, your very inventive Eye Chart, your rusty rake for displaying your gifted collages, your coat hanger dripping with wide laces and those sweet little vintage embroidered monograms. Thank you for sharing everything with us and I will return. Oh my so beautiful. Love your creating space and could sit there for ever..
Hi Julia! Your studio is a work of art in itself. It looks like such a relaxed place to work in. Your idea for the eye chart is great! Thanks for taking the time to set it up for our visit! Such a breathtaking space Julia! I could spend hours here looking at your treasures! thanks for sharing again with us this year! Meine Liebe, wenn bei mir so toll aufgeräumt wäre wie bei dir hätte ich auch mitgemacht ;) Ganz ganz tolle Bilder und da gibt es soviel zu entdecken. So ein Garnrollenhalter fehlt mir auch noch. Your studio is so lovely Julia! Love everything especially that chippy white cabinet!!!!!! And I like how you lovingly display all your treasures!!!!! enchanting....dreamy. you know i love all that lovely "white" inspiration and you display it all here to perfection! so many lovely touches....Maybel looks so sweet in her summer finery and i love your "french" corner and all of the gorgeous gifts from your creative kindred spirits! "merci" for the tour! what a pelasure! Oh, how beautiful and peaceful your space is. I see so many ideas that I would love to try. But, where to start. I really enjoyed my visit. Thank you. Yup, my fav creative space of all time. Love your creativity and how you've organized it all. I've watched you for a few years and pour over all your photos. Keep it up, Julia! We love you. Your studio is wonderful, I especially love the eye chart and the way you display the lace pieces hung from the wooden hanger. Inspired ideas! Thank you for sharing. My favorite visit so far today. You have to see my studio, as you and I would get along very well. If I am not already a follower I am now. Love love your creative space. What a dreamy and most beautiful studio my sweet Julia,-You have a gorgeous hand in making vignettes and decorations all over, and this almost new studio of yours, is a wonderful proof of that. I so love all your wonderful creations, and thankyou for showing gifts from me around in this dream-studio!I`m so happy to be there with you and all the other artist friends of you and me. Your Maybel looks quite fresh and sommerly enjoying this place from where she can follow all that happens around her, lol. And the corner shelf is just filled with so much beayty, too dearest Julia- you must feel happy in this room to where you can drag yourself back from the world outside, to dream and enjoy your creating and love for all things lovely. p.s. yesterday went a card off to you, I hope it reaches you in time , kys, kys. Liebe Julia, Du meine Güte! Das sind wirklich Hammer-Bilder von einem Hammer-Studio. So ziemlich das schönste Kreativ-Zimmer, das ich je gesehen habe. Auch wenn man die Fotos vom letzten Jahr kennt, gibt es hier wieder Neues und Anderes zu entdecken. Einfach "zum-Nase-am-Monitor-plattdrücken". Glückwunsch zu Deinem kreativen Händchen liebe Julia. Wow how lovely! Each area just makes me want to sit and play, touch and admire! Lovely gorgeous photos and inspiration galore! Love the cutting table and pure creamy goodness. Peaceful yet so amazingly full of lovely crafts and ideas! Thank you so much for the tour! Your room is so pretty and there are so many beautiful collections! Thank you for the tour! Julia, I love your studio. It felt like home to me. I especially love your dress form, that made me smile. LOVE all your white on white displays and your gorgeous works. Your space is so tidy and yet full of wonderful details. That personalized eye chart is so clever. Keep smiling and creating. Thanks for sharing your space and art. so heute nachdem ich endlich ausgeschlafen habe und die Kopfschmerzen ein Segen momentan weg sind (hatte gestern Nachmittag noch Migräne bekommen und die kann ich dieses Wochenende gar nicht brauchen, hab ich ihr auch gesagt), komme ich endlich zum kommentieren. Du weißt ja dass Dein Studio mein Favorit ist und daran hat sich auch nichts geändert. Alle diese liebevollen Details machen es einfach ganz besonders. Den Bügel mit den angeklippten Spitzen finde ich ja wohl toll und Mabels summer outfit mit dem Fischnetzrock, so clever. Deine Spitzenfische finde ich übrigens auch total schön und sommerlich. Deine Burlapgirlande ist auch wieder so schön geworden und ja, dass wir beide die Idee hatten mit dem Augenarztschild finde ich eh genial, nur dass Du das mal wieder viel ordentlicher umgesetzt hast als ich. Ich finde es gerade so schade, dass wir uns nur virtuell in unseren Studios besuchen können. Da wäre so vieles bei Dir was ich gerne noch näher ansehen würde, aber jetzt bist Du ja noch weiter weg als früher. Ich kann mir gar nicht vorstellen, dass Dein Studio auch unordentlich aussehen kann, weil alles so toll organisiert ist. Dein Zuschneide-Apotherkertisch ist mein Lieblingsmöbelstück in Deinem Studio und die große Weidentruhe mit den Körben darauf. Worauf Du u.a. aufpassen müsstest, wenn ich Dein Studio betreten würde wäre Dein alter Sonnen- oder Regenschirm, denn so einen suche ich schon lange, aber bisher waren die immer unerschwinglich. Ich wünsche Dir noch ein tolles WBC Party Wochenende! Love your creative space, Julia! This is what my room wants to be when it grows up! : ) I love everything in here. That eye chart is such a great idea and I like how you have pretty things on display. What a beautiful space. I love the way you display gifts from friends. The eye chart is brilliant. Thanks for sharing your space. Wow Julia- what a serene space! The unity created by color is gorgeous- my own craft room is a bit more... gypsy (?) but without the fringe and tassels. :) Your lace hangar really caught my eye- did you alter it yourself? I'm looking forward to coming back for another visit! Enjoyed your photos so much! Your studio is stunning, and you shared so many wonderful ideas: My favorites are the fabulous eye chart, the beautiful altered hanger with lace strips, the creative display for your heart collection, and that whimsical wire piece that holds trinkets! I also loved your French shelf and your pretty collection of sewing notions. I enjoyed seeing the mix of white/off white with some warm natural wood. You used a very pleasing combination of the two. Thanks so much for sharing this gorgeous area. I loved my visit! Hi Julia, what an amazing creative space you have. I love all your special touches and ways or organizing. I would never want to leave this wonderful studio. You are so very talented. I so enjoyed this visit. Hello Julia, my, my, my your studio steels my breath away. It is gorgeous. You must go into that space and never want to leave. Well girl I loved your studio last year and it is still just as beautiful. That metal basket is to die for and I love Maybel's summer outfit! In a studio like this yuo can't help but create all the gorgeous work you do! dieser Raum ist wirklich faszinierend! So viele kleine, feine, liebevolle Details, sooooo viel Material zum Verwerkeln- man möchte sich am liebsten hinsetzen und seiner Phantasie freien Lauf lassen! Du erschaffst aber auch so tolle Dinge, diese Spitzenfische z.B. sind zauberhaft! Meine Ponys sind ja jetzt in den Ferien bis zur 1. Septemberwoche, meine Tage haben plötzlich so viele Stunden, und ich merke, wie ich wieder vermehrt Lust habe, was mit den Händen zu werkeln! Im Moment ist ein kleines Schränkchen für's Bad in Arbeit, und so langsam wird's was! Vorhin hab ich die neueste "Molly makes" eingesogen; auch dort wunderbare Anregungen! Ich wünsche dir ein wunderbares WE mit viel Raum für Kreativität und Erholung! I'm speechless! Your creative space is stunning! I love every square inch and now you have me wondering how you ever leave the room. I'd live in it! Lots of pinning going on here. Hi Julia, thanks for sharing your amazing space, beautiful, so bright and organized! Love your beautiful vintage creations! I'm finding I like the studios with white furniture and accessories, lace and linens, they're so feminine looking. You've created a nice work space. Meowllo Julia, Cecil and Milo! What a wonderful, wonderful creative space!!!! We love the whites and laces!!!! We have a great deal of shared interest there. "She" likes to create with laces, while I like the white AND laces because my cat fur shows up nicely on it after I remove myself from naps ;) Of course that's only if I can catch her when "she's" working with it because otherwise it is not within my reach. Milo and Cecil do you have that same issue?!? Must also comment that you were very clever in creating your own eye chart! What a spendid idea and we like it much better than the real thing! And the bunting is a wonder use of the burlap, lace and buttons! Timeless beauty and purrfect for your creative space!!! Thank you so much for sharing your space with us and providing such a nice tour! We enjoyed ourselves! What a great room, Julia.I really like it. Wow. The cloth hanger with laces is stunning. Hi Julia, nice to visit you again. I've been following you since last year's party. You always continue to inspire me with your pretty laces and linens. Thank you for sharing your amazing creative space! Julia, I had the best coming over for a visit! I love all the laces and trims.. a girl after my own heart! Cute way to display them hanging from the vintage coat hanger. And the eye chart..I'm in love! Have you ever considered doing special orders? Let me know as I would love one and I'm not that great on the computer. What size is yours? Oh, and my mannequin would love to set up a lunch date with yours.. mine adored the summer outfit that yours is wearing! Brilliant space to work in, so full of inspiration and calmness. I just love how you have used hangers and rakes to display things off them (I like looking for old antique hangers, among a few hundred others things I like to find : ) The eye chart is divine and again what a great idea to use it with your blog name, fun!!! I really love your white on white space and all the beautiful pieces you have there, thank you so much for sharing. so very charming--each and every bit, julia:) maybel is just darling, too! thanks for sharing--love your space! Loved the tour and all your wonderful vignettes! Thank you so much for sharing! Your space is just a dream! So many beautiful, inspiring things in one room! Oh, the metal basket! The dress form outfitted for summer! The eye chart!! So much wonderful stuff; such beauty. Fabulous use of space- it all looks very tidy (at the moment!) You have used some storage items really well and it's made me think what to do when I move. 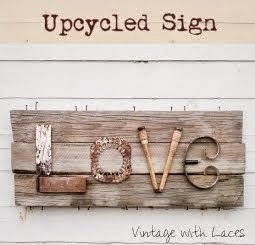 I love all the vintage items - and some you've made useful not just decorative, I like the idea of clothes hangers holding lace pieces and various storage boxes and stands. Great space - I fear I wouldn't be able to keep it so neat though! Your space looks like it stepped right out of a magazine... nice job and thanks for sharing! Take care. There so many beautiful things in your studio! From the hanger with the lace, your picture framed hearts and your corner shelf. I must look for one of those myself, yours looks great painted. Such a beautiful and calming area to work...love everything! Always love seeing your space - so serene with all the white. And your creations are to die for gorgeous! Thank you for the peek! Julia, what a gorgeous studio and so many beautiful vignettes. I will be certain to come back when I can spend more time. I see many great ideas that I can borrow from you, hope you don't mind. Happy creating! It's like a little vintage shop in there. I am not sure I'd ever get anything done in such a sweet space. I'd want to sit and stare at everything all the time. Love it! Everything in your studio is gorgeous!! What a wonderful creative space to work in! als ich nicht übermorgen zu hause bin, will ich schon here heute dir alles gute und einer wunderbares geburtstag wünschen!! Ich hoffe meine kleine karte will beim dir sein in zeit, und hoffe dass es einer guter tag sein will!! Schöne grüsse, und liebesvolle geburtstag wünsche für dich meine liebste freund!! Ich schicke dir viele umarmen und küsse- von deiner Dorthe. Hoffe alles geht gut ?? I love to see all the pretty things you keep around you. So beautiful! Your studio is a DREAM! I love your organization ideas! ~M. Your studio is so pretty. I love the white furniture and all the great organizing ideas. Your white and lacy studio is just dreamy! I'm so glad I stopped by for a tour. The large frame filled with hearts is such a thing of BEAUTY. I love the laces hanging from the hanger, and the way you've decorated the tops of your big glass storage jars. All of it...just too yummy for words!! Wow! What a beautiful studio you have! So many treasures and yet it's so functional. It's like a small museum. Thanks for sharing. Such a glorious room! I love how your "no color" scheme feels so warmly textured and inviting. Thanks for sharing!! How gorgeous and what talent you have! I'm glad I found you through Common Ground. What a neat space! I am currently working on an office/craft room/studio overhaul. Yours is certainly inspirational! I found your blog via The Polka Dot Closet. I'm going to add you to my blog roll and would love to come back and visit again! I was looking at your beautiful things on your blog and came across a photo of your vintage monogram appliques. On the top I saw the initials TC. I have been looking everywhere for my initials but have no luck. Can I buy that one off of you? I've found another blog to follow. Oh my! I adore every inch of your space or might I say, "spaces." White is my favorite and of course, the lace! You have given me inspiration! Thank you! ich komme einfach mal wieder auf einen Sprung bei dir vorbei, zum virtuellen "plaudern" und um dich zu drücken für deine immer wieder so lieben Kommentare! :o) Total praktisch, wenn du gerne Hühnchen isst und dich Baxter so gern damit verwöhnt - dann hast du wenigstens immer die richtige Grundlage für Lavendelhendel oder Curryhuhn ;o)) Vielleicht kannst du mit den Nachbarn ja eine Vereinbarung treffen - dass du die Hähnchen so wie beim Metzger bezahlst, und Baxter ist quasi dein "Einkäufer" *ggg* Lamm mit Lavendelsoße klingt auch großartig... und Fleischliches ist mir sowieso ebenfalls viel, viel lieber als Tofu, denn der ist auch nicht "meins". Aber ich weiß, dass manches, was mit Fleisch geht eben durchaus auch mit Tofu funktioniert, vorausgesetzt, er ist gut gewürzt. Wenn schon vegetarisch, dann ist mir persönlich aber Grillkäse lieber... :o) Den mag ich sogar richtig gern! Fühl dich herzlichst rostrosig geküschelbüschelt - und zärtliche Fellchenstreichler schick ich auch mit! Lovely space! Love how you have 'elbow room' and still room for lots of supplies and lovely things on display. WOW - I want to live there!!! Gorgeous and so wonderfully vintage!!! I'm loving it! I don't know how I missed viewing your beautiful creative space. I participated for the first time and I thought I view every single blog. I found your tonight on Pinterest and clicked on a several year old project of yours. great job, I love love loved the vintage white frame of vintage and lace hearts. Hi Sweetie! I adore your frame with your heart collection! I have a small collection, too, and need to make some myself to add to it. Such a pretty and creative piece! Love all you do! And of course, your studio is...sigh...gorgeous! Wow! Love all the vintage touches, the cabinets and especially that frame with all the hearts... so beautiful! What a great room - thank you for the delightful tour! Oh my goodness, your space is just so wonderful... all of your treasures...so special!!! I wish I could spend time there!! I love your studio space! So many wonderful pieces and ideas. I so love your work space. It is gorgeous- and so are your goodies that you've decorated with!